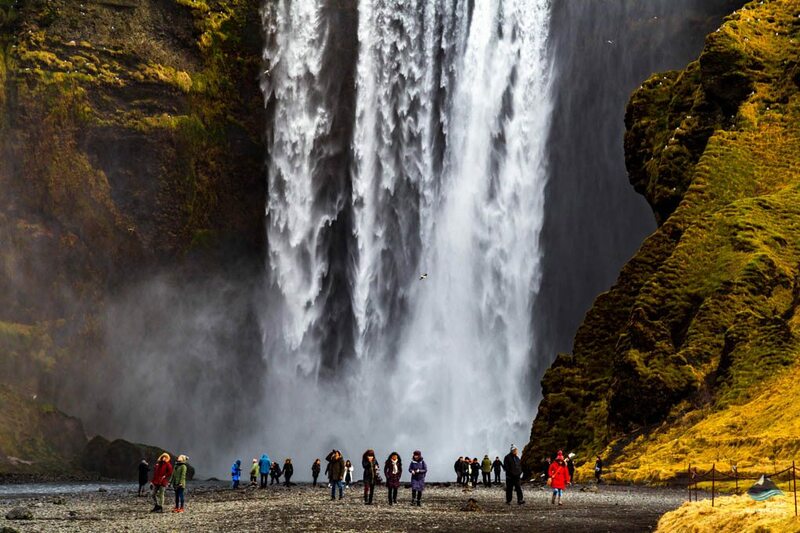 Skógafoss (Skogafoss waterfall) is one of the largest and most elegant waterfalls in Iceland, it has a width of 25 meters and the cascade drops 60 meters. 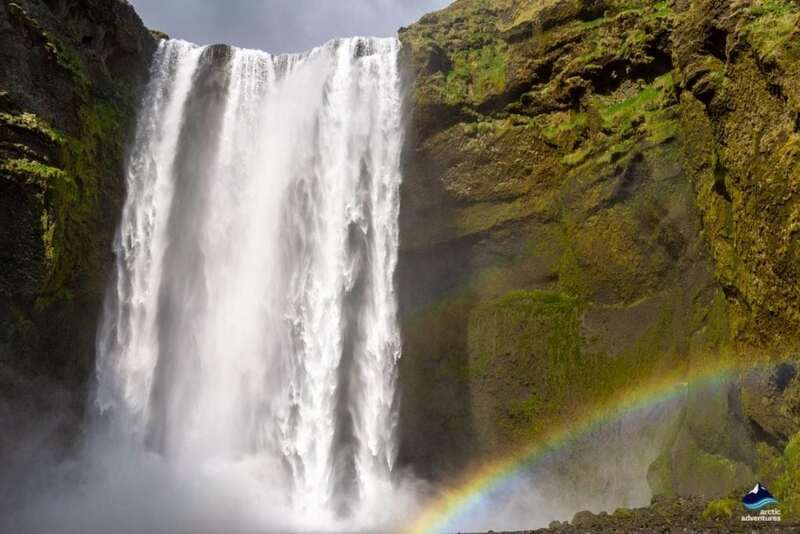 A waterfall of this size generates a lot of spray which often creates a single or double rainbow on sunny days, adding to the charm of Skogafoss Waterfall. 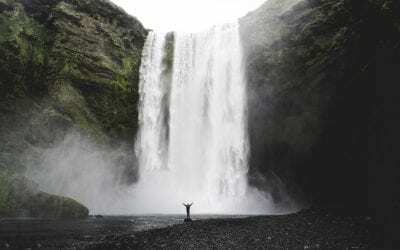 What does the name Skogafoss mean? 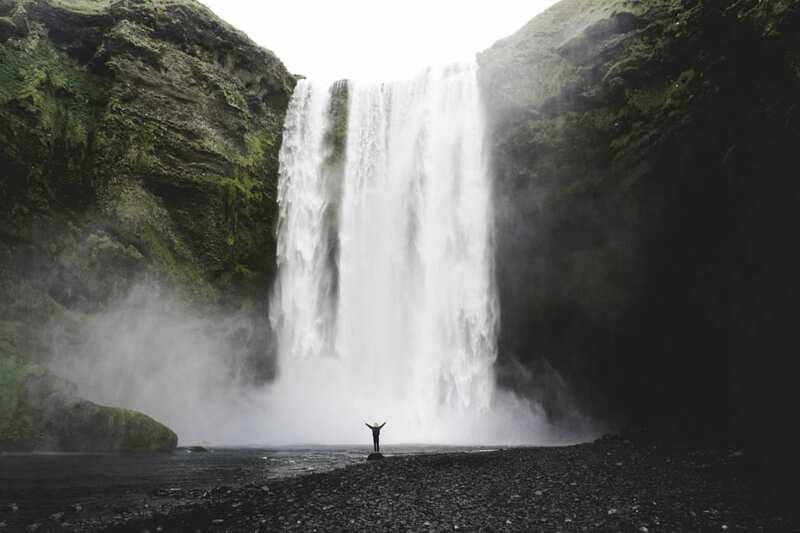 If this waterfall seems to be familiar to you this may not be déjà vu! 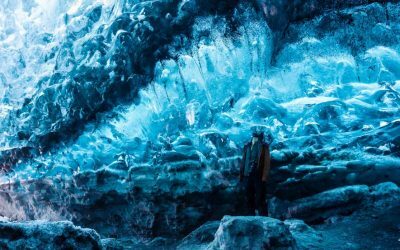 This location has been quite popular with film-makers, scenes of Thor: The Dark World and The Secret Life of Walter Mitty and other productions were shot here. 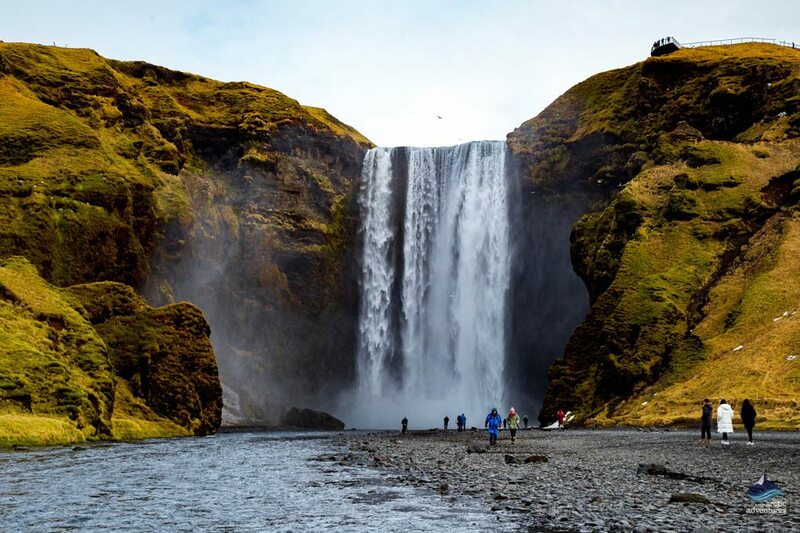 Skógafoss is on the Skógá River in South Iceland, the cliff from which these falls descend is the former coastline, which has now receded in a seaward direction about 5 km. It is easy to see how dramatic this coastline must have been in the olden days! The former sea cliffs now run parallel to the coast for many kilometers, these mountains create a kind of border between the lowlands on the coast and the highland areas of Iceland. 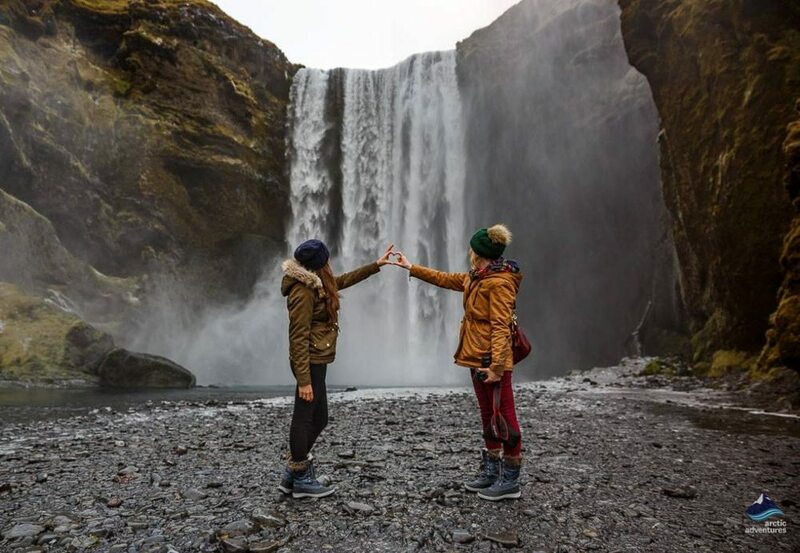 Skógafoss is situated in absolutely spectacular scenery, on the eastern side, there is a trail which leads up to the famous Fimmvörðuháls pass. 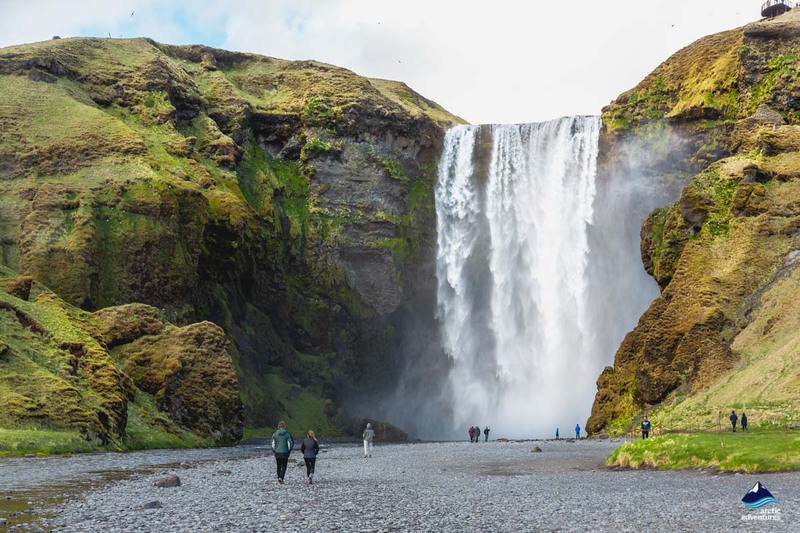 You do not need to walk for many minutes along the pathway from Skógafoss to be rewarded with majestic and spectacular views. 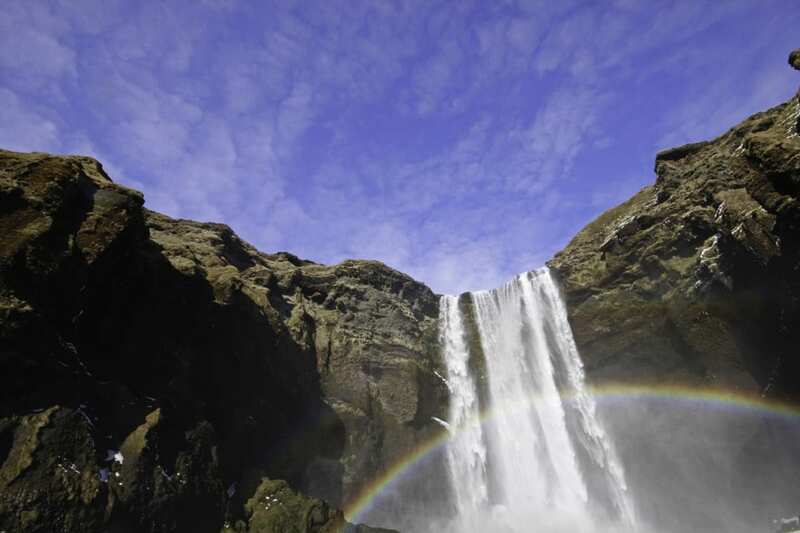 The are dozens of waterfalls on the trails running from the same river as Skógafoss itself. 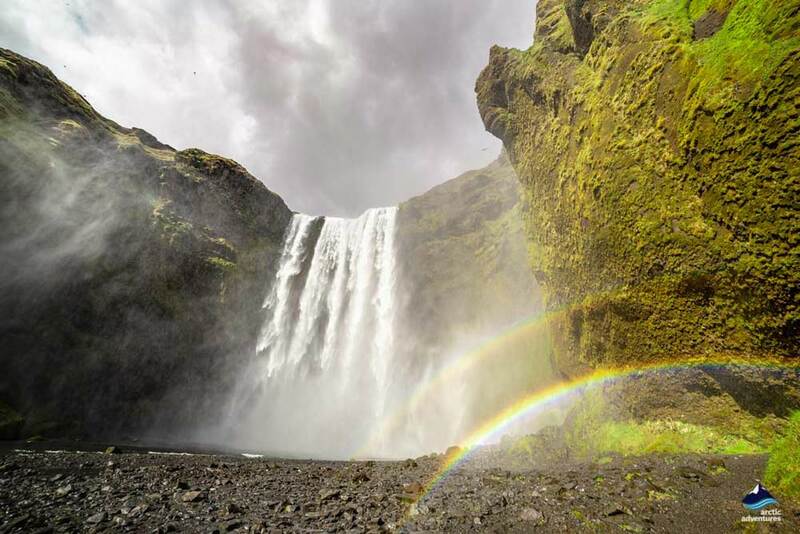 There is a wonderful legend in which the first Viking settler in this area, Þrasi Þórólfsson, buried a treasure chest filled with gold behind Skógafoss. It is said a local boy found the chest some years later, it was possible for him to take hold of the ring on the side of the treasure chest before it vanished once again. Allegedly, he retained the ring which was given to a local church, nowadays there is a ring, reputed to be from the chest, in a local museum! 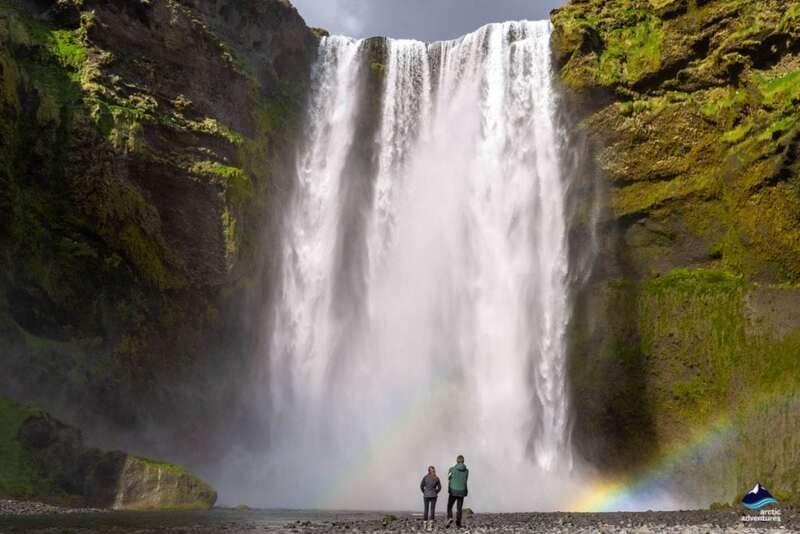 So legend has it that a treasure chest of gold is still waiting to be found behind the waterfall making Skógafoss truly a golden treasure of Icelandic nature just waiting for you to discover it! 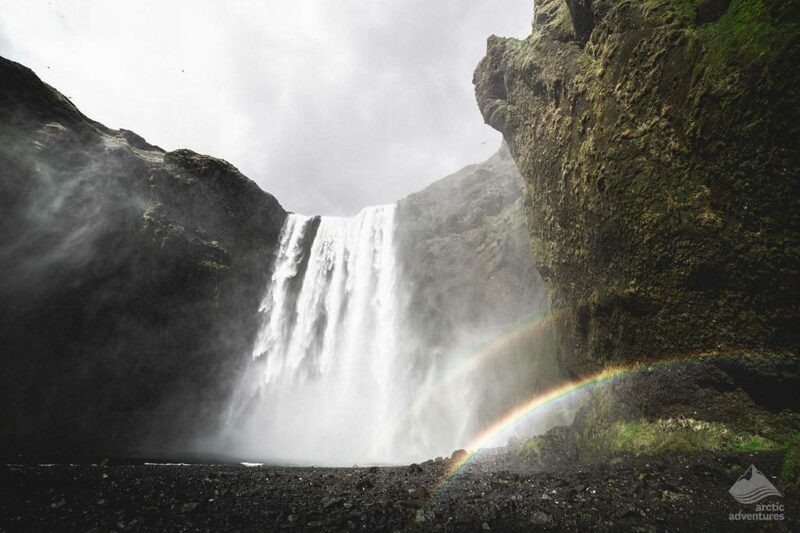 The second folklore having to do with Skógafoss is about a Troll. 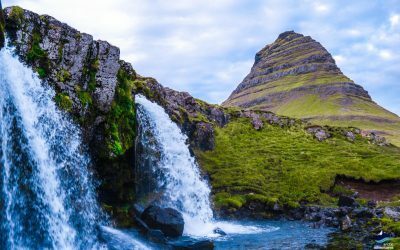 Trolls, elves and other hidden creatures are common in Icelandic folklore so it might not come as much of a surprise that one of Iceland’s best waterfalls has a Troll story. The story has not been recorded very well but goes a little something like this, a gigantic Troll was walking around at the South Coast carrying a smaller Troll on its shoulders (some say it was the trolls son but others say baby brother) when it stumbled upon a great, big and beautiful waterfall, Skógafoss. The Troll was in an awe and stared at the waterfall for too long, the sun came up and turned them both to stone. The Trolls now rest in the hills of the waterfall staring at it for all eternity. They can easily be spotted by hiking up the East side of the mountain. Halfway up take a left turn and walk onto the leap you’ll see it! 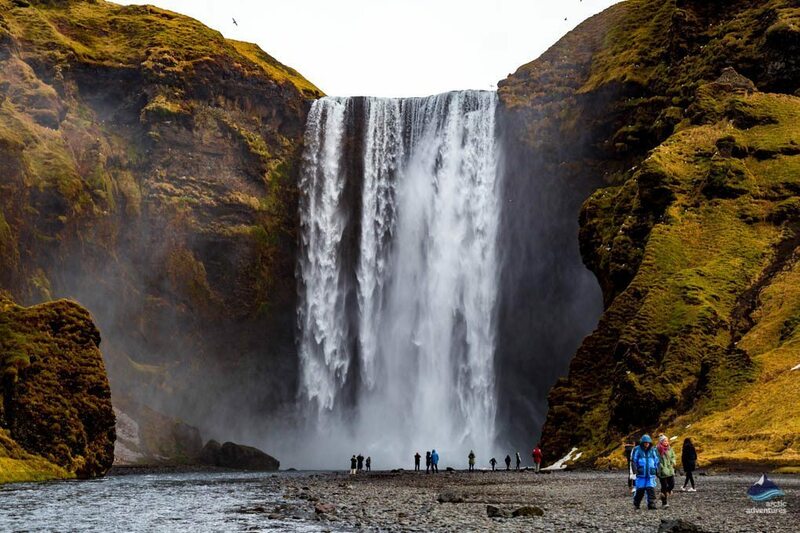 Skógafoss Waterfall is located on the south coast 149 km from Reykjavík. For those traveling from an easterly direction, the distance from Skaftafell is 173 km. 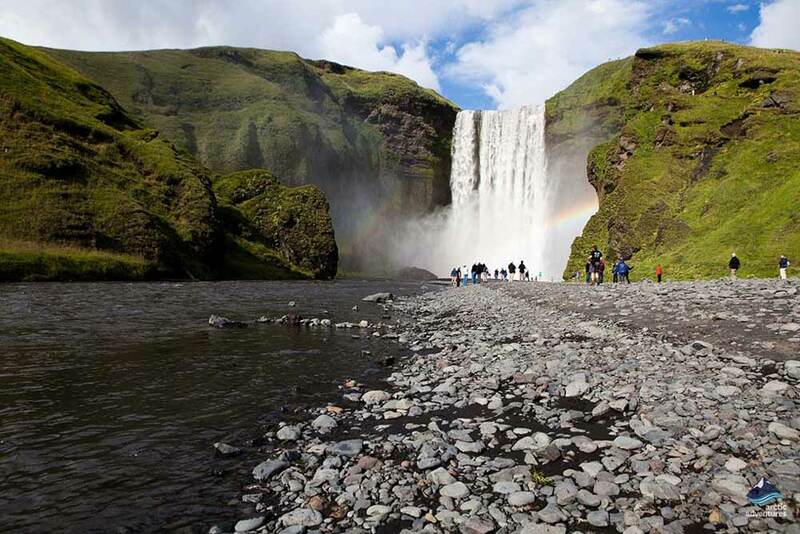 Other attractions in the area include Vík (37.4 km), Reynisfjara Beach (34.5 km) and Seljalandsfoss Waterfall (29.3 km). 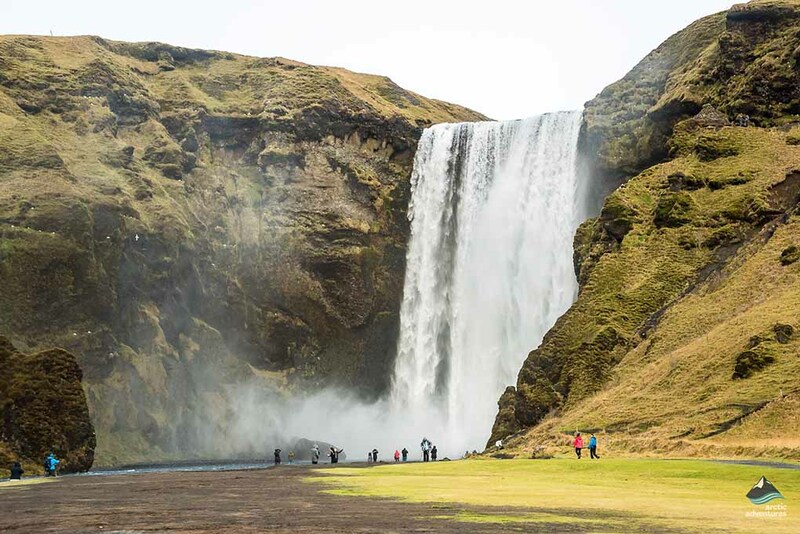 Skógafoss is easy to spot, right off the Ring Road 1. 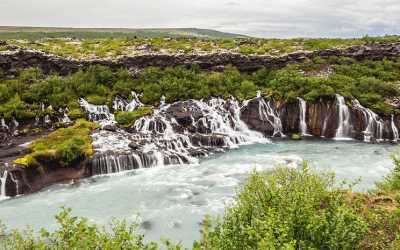 The drive from Reykjavík will take you through the villages of Hveragerði, Selfoss, and Hella. 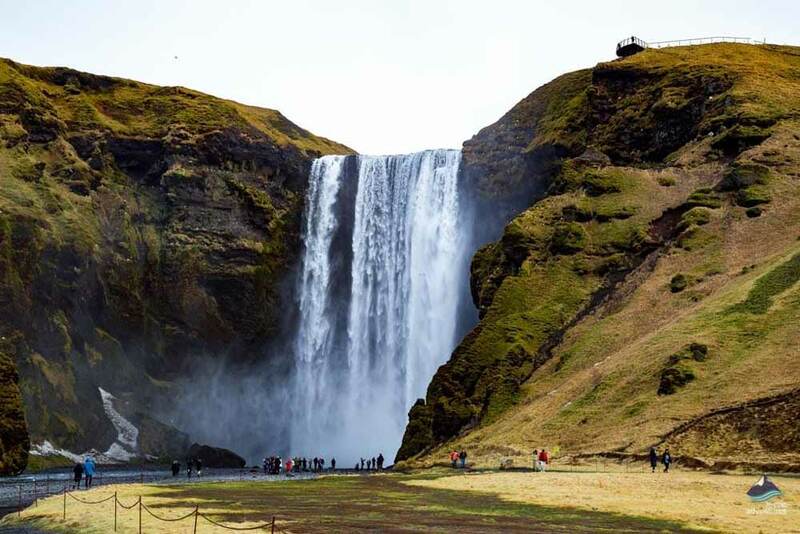 You will pass Seljalandsfoss and continue onwards towards the village Vík. 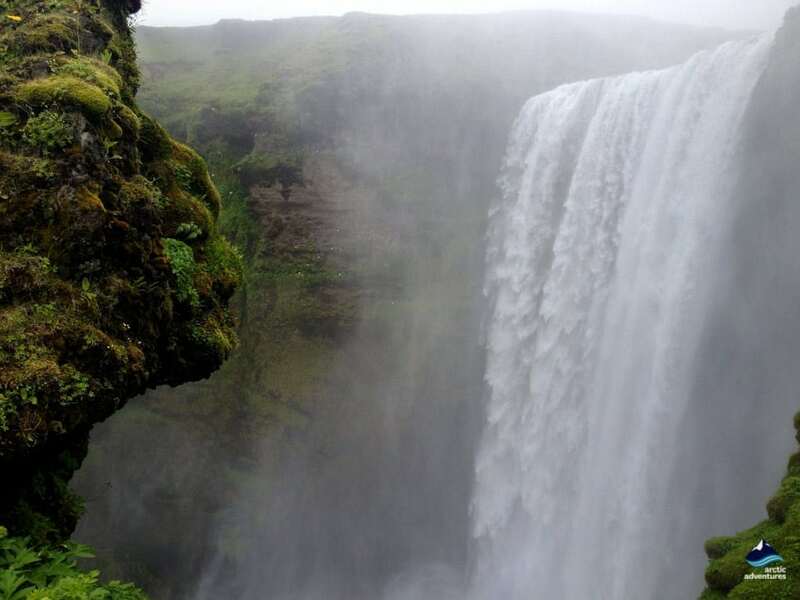 After having passed Seljalandsfoss you have about 25-30 minutes of driving before reaching Skógafoss. 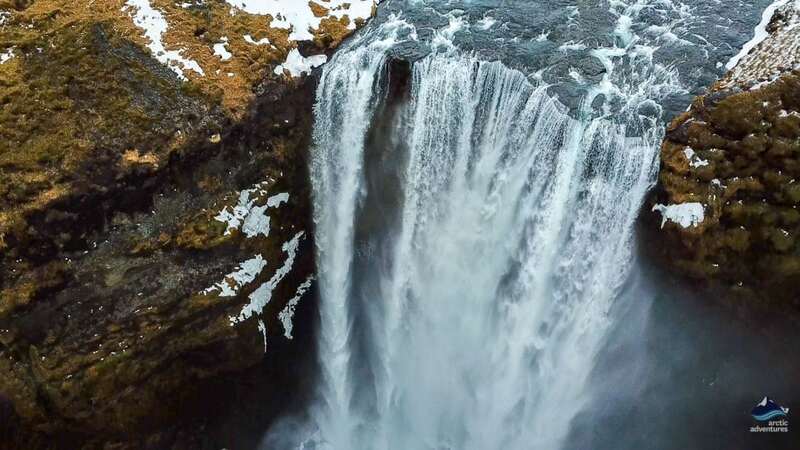 If you are driving the Ring Road towards Reykjavík the waterfall is about 25-30 minutes from Vík. The waterfall is visible from the road but there are also signs to guide the way. 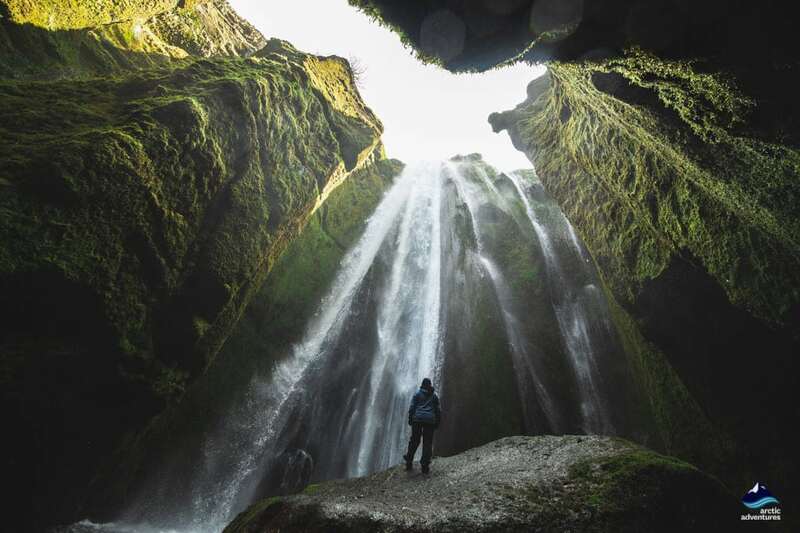 Skógura is a forest in Icelandic and Foss means waterfall. In the Icelandic language, we change each and every word a million ways when using it. This is a bit like the ‘s used in English. Skóga is one of the ways to change the word Skógar and fits better when put together with the word foss. 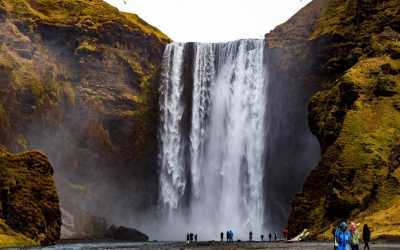 Skógafoss, therefore, translates Forest Waterfall. This might be a bit hard to believe given the lack of trees in the area but Iceland was actually 25% covered by trees when the settlers arrived in the eighteen hundreds. Don’t go too close to the waterfall’s drop, it is very powerful and heavy. 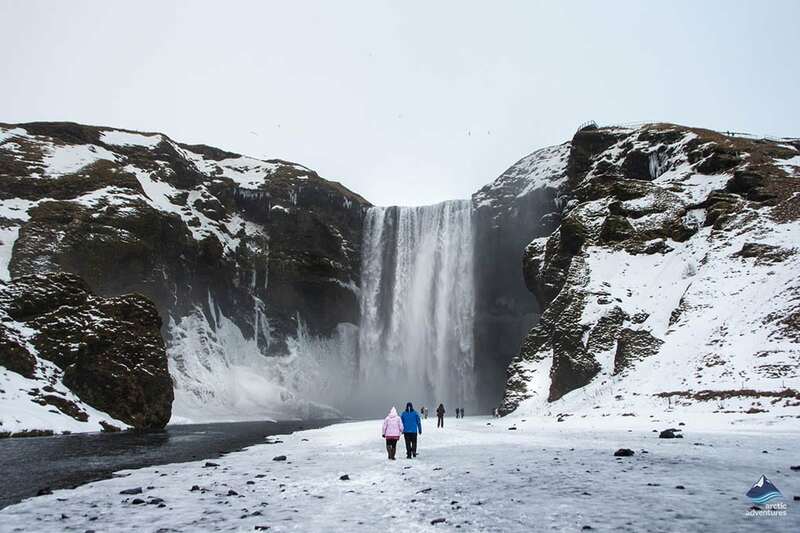 It can get pretty chilly going close to the waterfall because of the spray from the drop so waterproof clothing is recommended for those planning to go close. When hiking up the track on the right side of the waterfall keep on the marked paths. Skógar, the area of Skogafoss has the lovely Skógar Museum. The museum is open June, July, and August from 9 am to 6 pm and the other months from 10 am to 5 pm. The Skógar Museum is split into 3 different parts. There is the Open Air Museum, The Folk Museum, and the Technical Museum. When purchasing a ticket (2000 ISK per person for adults) you get admission to all the museums inside and out. 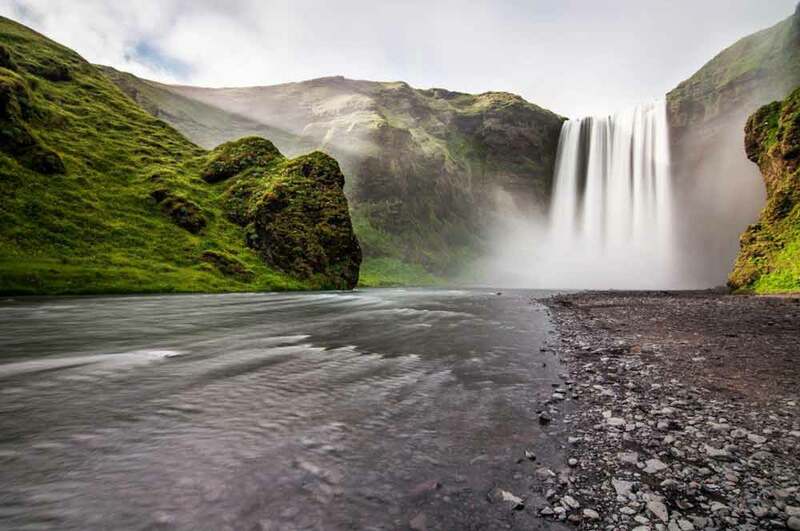 The Skogafoss area is famous for its outstanding hiking paths, the most famous being the Fimmvörðuháls trail. Fimmvörðuháls or the mountain range of the five cairns is the original eruption site of the 2010 Eyjafjallajökull Stratovolcano eruption and one of the most popular paths to take for hikers in Iceland. 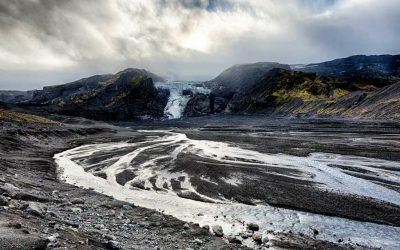 Fimmvörðuháls is an area between two glaciers Eyjafjallajökull and Mýrdalsjökull and is one of Iceland’s most beloved hiking trails. 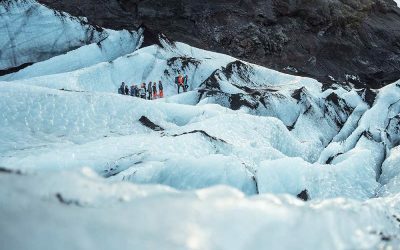 The combination of black sands, glistening glaciers, green fields, and numerous waterfalls is a true dream and is the experience of hiking across the pass is truly sought after by all nature lovers and photographers, amateur or pro. 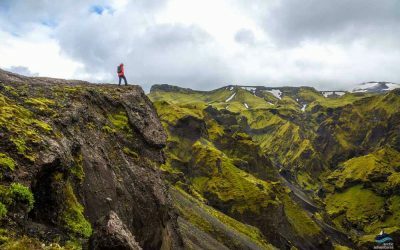 The hiking trail will take you past the newly created volcanic craters Magni and Móði which formed in the Eyjafjallajökull eruption and end inside the fertile valley of Thor, Þórsmörk. 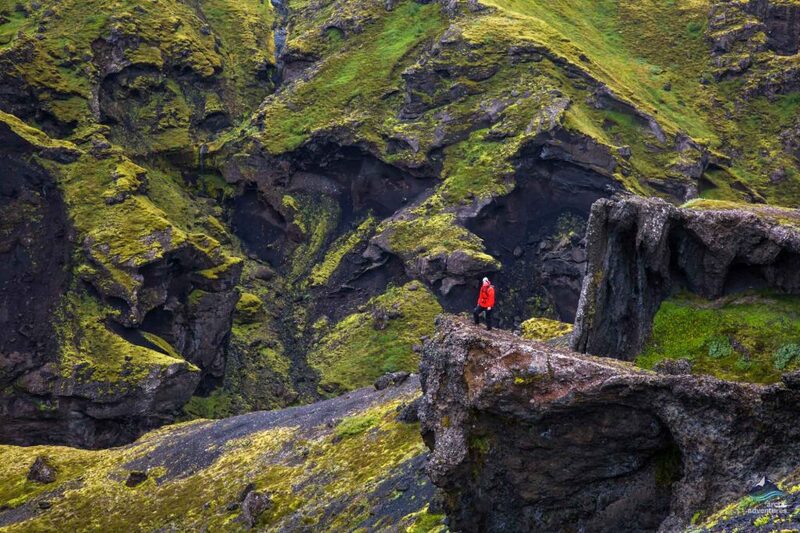 The trail is 22 kilometers long (14 mi) and is usually done as a day hike with a night in Þórsmörk after. Some like to do it the other way around from Þórsmörk up to the pass and back down in a day, this version has been named the Þórsmörk Volcano Hike. 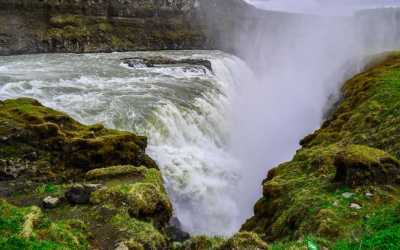 Skogar, the Skogafoss area is a lovely and beautiful area to stay the night while traveling around the South Coast of Iceland. Your options for accommodation is divergent. 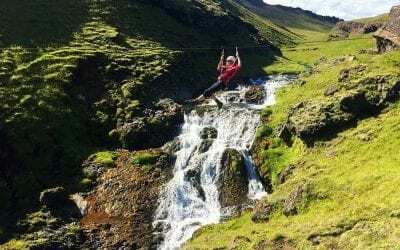 Some people like to camp in the camping area at Skógafoss, others like to rent a cabin near and others like to stay at the hotel. 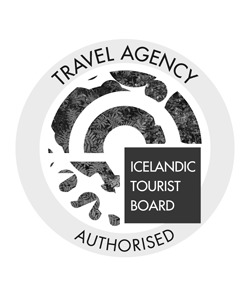 Hotel Skógafoss Restaurant Bistro Bar – Breakfast, lunch, brunch or dinner they do everything well! Mainly European cuisine. Open all day. 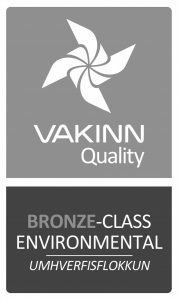 Restaurant Hotel Skógar – From fish to meat they are makers of proper great food. Open for breakfast lunch and dinner. Open June-August 9 am to 6 pm and from September – May open 10 am to 5 pm. Skógakaffi Café – a cafeteria offering basic baked good and snacks and even more options in summer. 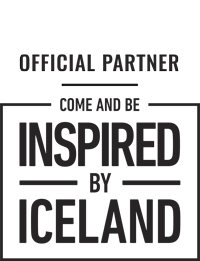 Mia’s Country Van Sveitagrill – Fish and Chips food truck with delicious fresh fast food. Open 12 to 4 pm. 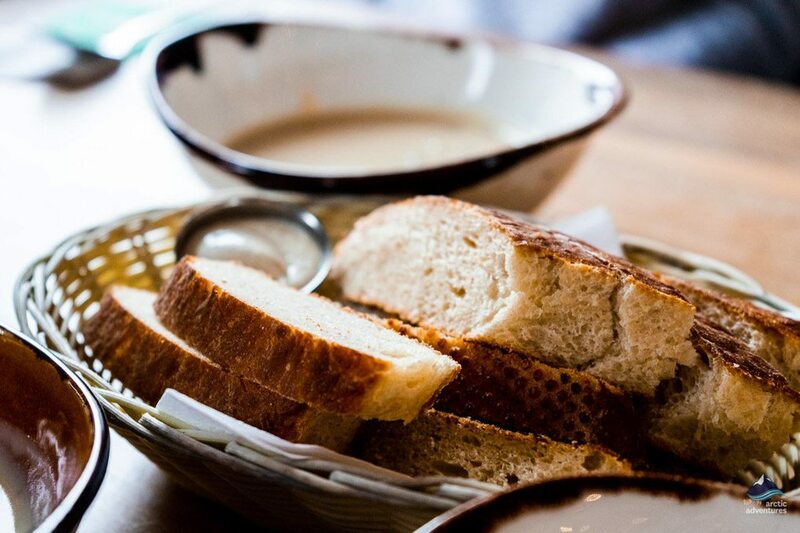 Gamla Fjósið – located in an old cow stable, a lovely experience and yummy food! Open 11 am to 9 pm. The Black Beach Restaurant – a little bit of everything from burgers to soup open 11 am – 6 pm. Drangshlíð Restaurant – good traditional Icelandic food. Open for Breakfast and Dinner. 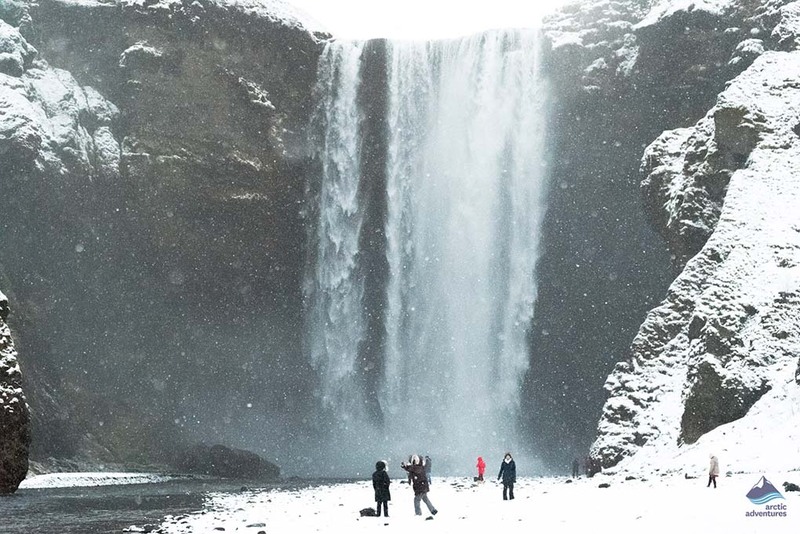 Skógafoss turns into a true winter wonderland during the coldest months, with the slopes turning icy and white with snow, and the waterfall dripping with icicles and frosty sparkles. The amount of spray from the waterfall reduces but when it hits you, you will get cold much sooner so try to keep a good distance. 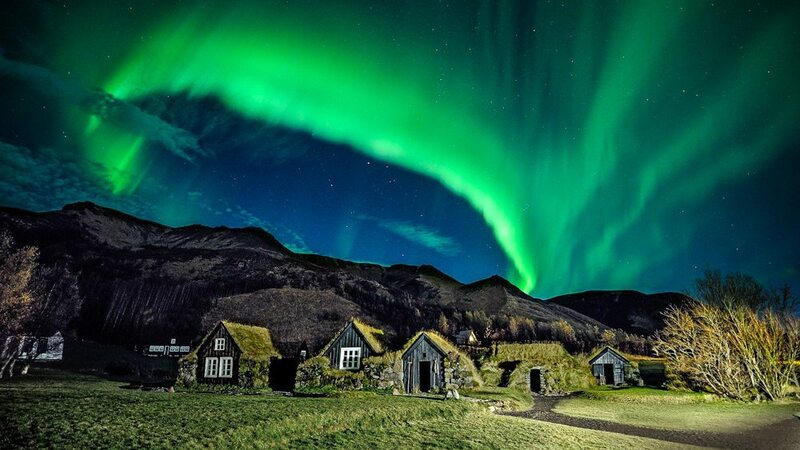 To watch the Northern Lights dance above the waterfall is especially impressive but will only happen in nighttime! 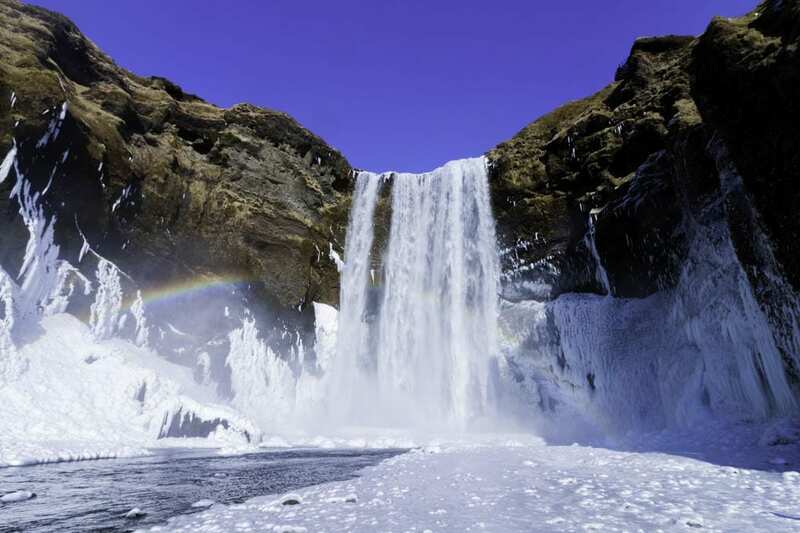 If you are doing a self-drive tour to Skogafoss in winter be mindful of the road conditions. 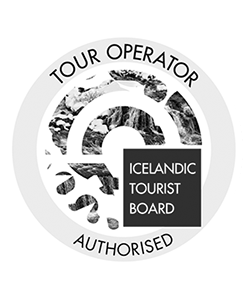 If you aren’t used to driving in snow and on slippery roads you might want to rethink doing the driving yourself and possibly switch to joining a tour. Dress according to the cold weather, keep wool next to you and warm socks are essentials! 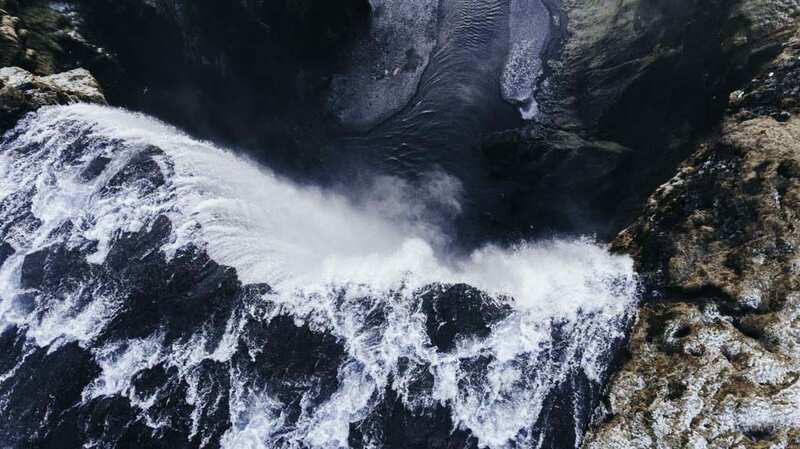 Vikings (2017) in the 5th season there is a scene where Floki, (Hrafna-Flóki or Raven Flóki) is seen staring at the alluring waterfall Skógafoss. 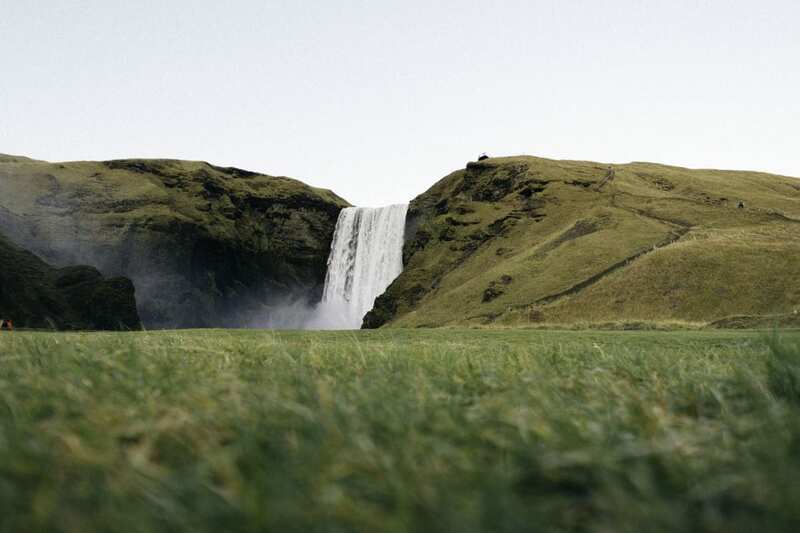 Justin Bieber – I’ll Show You (2015) in the video Bieber is seen walking, running, swimming and skateboarding around famous location on the South Coast in Iceland, including Seljalandsfoss, the plane wreck at Sólheimasandur Black Sand Beach, Dyrholaey Cape, Fjadrargljufur Canyon, Jokulsarlon Glacier Lagoon and of course our stunner Skogafoss waterfall. Thor: The Dark World (2013) this Marvel Blockbuster was filmed in a few locations in Iceland, Skógafoss being one of them. Land Ho! 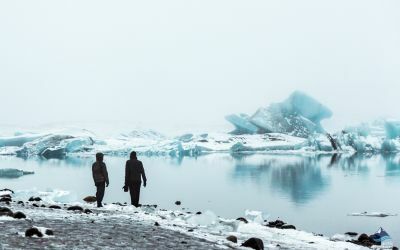 (2014) is a film about two ex brother-in-laws who travel to Iceland and visit all sorts of beautiful places in Iceland including Skógar. Adventure packed day trip from Reykjavík to Vatnajökull National Park. 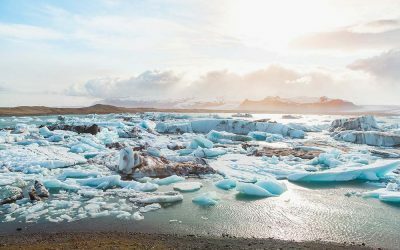 Includes Jökulsárlón Glacier Lagoon and glacier walking on Falljökull at Skaftafell.